Here is a close up of an adult male Downy Woodpecker. The active little Downy Woodpecker is a familiar sight at backyard feeders and in parks and woodlots, where it joins flocks of chickadees and nuthatches, barely outsizing them. 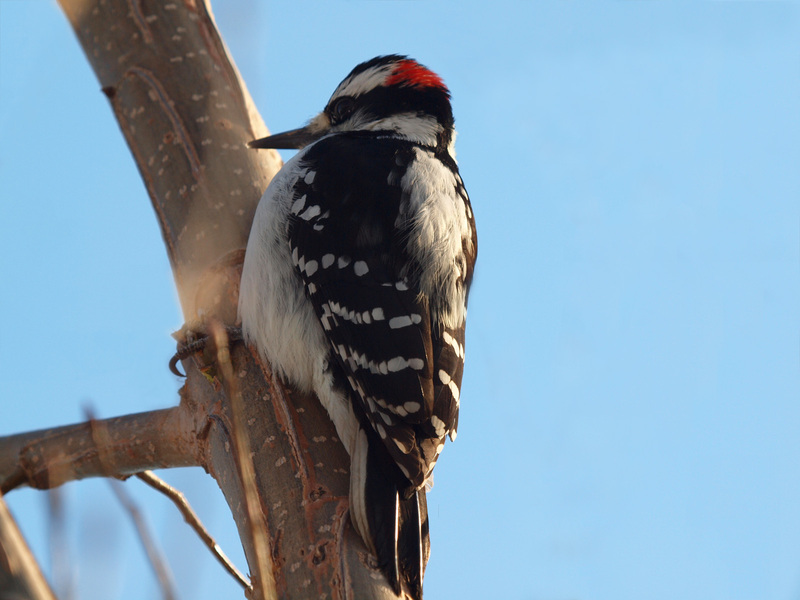 The Downy is the smallest woodpecker in North America and their breeding habitat is usally forested areas mainly deciduous which makes Caledon, Ontario a good home for them. They nest in a tree cavity excavated by the nesting pair in a dead tree or limb. Downy Woodpeckers forage on trees, picking the bark surface in summer and digging deeper in winter. They mainly eat insects, also seeds and berries. In winter, especially, Downy Woodpeckers can often be found in treed suburban backyards and will feed on suet at birdfeeders. Photo was taken with my new ultra zoom lens (50-500mm) and cleaned up a little in photoshop, click on the image above for a larger photo. Posted: November 28th, 2010 under Caledon, Photos, Wildlife. Was interested inyour piece on Caledon Lake but wasn’t sure exactly how to get there from the school nature centre. A friend and I tried but got lost. Do we stick to the north shore of the stream? or cross the bridge that you see as you walk in the property that ‘s on your right as you walk in? Need help this little young woodpecker flew into our livingroom window it seems to be sitting up i with a twig helped it hopefully it is just stunned What do I do put water food ?